From Arusha, set out in vehicles for the long drive to the starting point of the Lemosho Trail, the Londorossi Gate. Approaching the mountain from the west, the Lemosho Route starts in the Afromontane Rainforest, which is the first of four ecological zones you encounter on Kilimanjaro. Here you meet the rest of your crew and set off at a leisurely pace while keeping your eyes peeled for wildlife. Lunch is taken on the trail and camp is reached mid-afternoon. Overnight at Forest Camp. Crossing the Shira Plateau – one of the highest plateaus on Earth – is one of the most scenic parts of this trip during your 3-4 hour hike across moorland meadows to the lunch point. After lunch you ascend to Moir camp, arriving in the mid afternoon. If you have the energy, a hike in the late afternoon is possible in the surrounding Lent Hills, which makes this an excellent acclimatization opportunity. Overnight at Moir Hut. From Moir you traverse the slopes of Kibo. Here relatively little flora or fauna can survive the extreme temperature ranges and conditions that typify this zone. Lunch is normally taken close to a volcanic rock formation known as the Lava Tower. If you feel very strong there is an optional ascent of the 300-foot-tall Lava Tower before descending down to Barranco camp in the afternoon, passing through the strange yet beautiful ‘Garden of the Senecios’ (giant groundsel) which also features many giant lobelias. The Barranco Valley is one of the prettiest areas of the entire trail. Overnight at Barranco Camp. You now have a relatively short day to reach Karanga Camp, after conquering the intimidating Barranco Wall. Be prepared to use all four limbs as you traverse the wall to the top of the Karanga Valley. From here, follow a path that sojourns through many inclines and declines to Karanga Camp, arriving in the late afternoon. 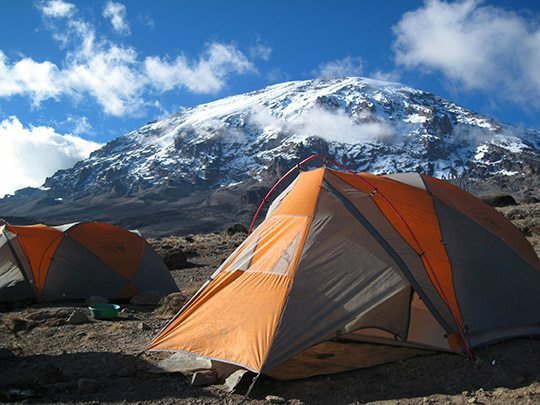 Our selection of Karanga Camp is strategic – significant time at altitude is essential for safe acclimatization. Sunsets here are particularly spectacular with views of the southern glacial valleys and ice fields towering over 3000 feet above you. Overnight at Karanga Camp. Today is another half day ascending to Barafu Camp. Once again lunch is taken in this high camp, allowing plenty of time to relax before the summit bid. Desolate alpine desert and, at times, strong winds rip over this camp, yet in the evenings splendid views of Mawenzi peak are the norm. A relatively early dinner is taken before resting for the evening. Overnight at Barafu Camp. After breakfast you descend once again through montane forest and at around midday, after saying farewell to your crew, you are picked up and transferred back to your hotel for a well-deserved shower and a celebratory dinner! Today you have a dayroom to pack, freshen up, and get ready for your flight home or your onward adventures in East Africa. The heather zone offers a stark contrast from last night’s camp in the rainforest. Get ready: Kili is going to serve up even more dramatic landscapes to come! An extra day on the plateau will help your body acclimatize, so use this time to take in Kili’s beautiful scenery and unique flora. Take the “scenic route” on this optional trek for dramatic views of the Shira peaks – and don’t forget to snap some pictures! Watch the clouds roll over the jagged peaks of Shira. Your camp is perfectly situated to bask in the glow of the magical sunsets. Just keep trekking! Continue up expansive ridges on a long, steady climb through the alpine desert. You’re above the clouds, situated next to one of Kilimanjaro’s most recognized landmarks – what’s better than this? Start your descent from the alpine desert into the moorlands, giving you time to acclimatize in the lower altitudes. The terrain of volcanic rock and boulders is dotted with strange and beautiful plant life, such as groundsels, giant lobelias, and everlasting flowers. The valley floor is filled with Giant Groundsels, known as “Dr. Seuss trees.” They can only be found on Kili, and can grow as high as 20 feet! It’s every trekker’s dream to traverse narrow switchbacks and scramble up the Barranco Wall. Be sure to show “Kissing Rock” a little love when you pass by it at the top. After the scramble, take a break and enjoy the view at the top of the wall. You’ve certainly earned it!